is a greenish and yellowish amphibian, native to the southwest US and northern Mexico, which grows up to 3.5 inches in length and can live more than 10 years. They are sometimes called spadefoot toads, but they belong in a unique family, different from Bufonidae, the family of true toads which have big poison glands behind the eye. Both the English and the scientific genus name come from their special hind feet, which have horny projections, like “spades,” specialized for digging in sandy or gravelly desert soils. They literally dig themselves into the ground, sometimes more than a foot deep, where they remain dormant for up to 10 months, in a cocoon of layers of shed skin, protected from extreme heat and drying as well as from predators. For additional information see Water Links. How do you give kids a sense of the enormous challenge it is to survive in the Arizona desert, kids who turn a tap for water, adjust a thermostat for cooling, and send someone to the store for food or treats? How can you pass along to adults a measure of the effort needed to adapt to the the drier and hotter conditions that (we are told) are in our future? One Tucson father and biologist has an answer. Jeff Simms has specialized in showing an animal story to our neighborhood kids (and to those adult neighbors who still consider ourselves kids): the story of Couch’s Spadefoot, a relatively common amphibian neighbor who can teach several lessons in how to survive in extreme aridity. 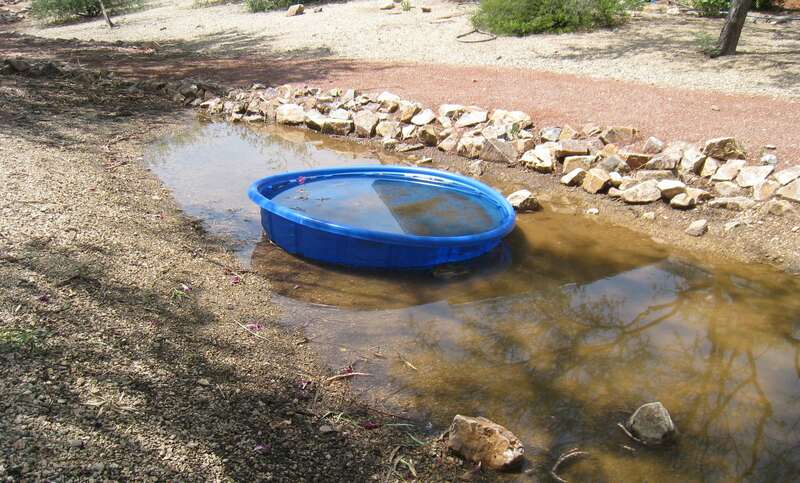 Our development on Tucson’s east side has engineered rain catchment basins into the neighborhood plan. We have such a “pond” in our cluster of houses that fills with any rain of at least .3 inch. When full it measures about 80 feet in length, and has a depth of 1.5 feet – perhaps around 250 cubic feet of water. The first filling this year came on August 27. In 2014 it first filled on August 16. The night after the first filling is noisy with several male Spadefoots calling for mates, competing, long into the night. By morning the adults have disappeared, but usually on the second day tadpoles are visible, hundreds of them. Then come the kids, usually a dozen regulars and a few dozen visitors. They stare in the water, catch a few tadpoles, sometimes wade in with their shoes. And they ask questions. Couch’s Spadefoot toads have focused both their food consumption and their reproduction on the short summer period of heavy or “monsoon” rains in the Sonoran Desert. The rest of the year they spend underground. It has been learned that what “awakens” them to the monsoon conditions is not the moisture itself but the noise or vibration of the storms, both thunder and the pounding rain. The adults emerge at night to a frenzy of breeding and feeding. Once temporary puddles have collected in the desert, the males congregate and begin to call the females with a periodic, and very loud, squawk or bleating. A few spadefoots can fertilize and deposit in the water thousands of eggs in a few hours. Then the race is on for eggs to hatch (15-36 hours) and the tadpoles to metamorphose – developing front and back legs and losing the tail (7-15 days) – before the water dries up. Both the toadlets and the adults then gorge on large quantities of food to sustain themselves until the next summer. They focus on invertebrates, especially termites, whose life cycle is also tied to the monsoons, but also ants, beetles and grasshoppers. 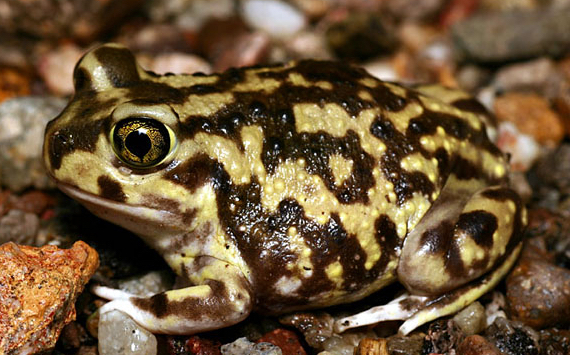 Because of their longevity, Couch’s Spadefoot can survive one or several years in which the temporary desert pools do not last long enough for a new generation to emerge. To keep enough water in the pond for the ten days most tadpoles need to metamorphose takes at least three substantial rains, properly spaced. Most years the rains don’t get it right, but Jeff has been willing to run some tap water to supplement. However, even with additional water there comes a point when the water runs out, often before every last tadpole has legs, and lungs. Last year it came on September 2, 17 days after the first heavy rain. By 9:30 am, at 87 degrees, only about a square foot of water was left. There were 15 or 20 tadpoles still swimming in that inch of water. By 11:15 am the water was gone. The few remaining tadpoles had covered themselves with a thin layer of mud at the bottom of what was the last pool. Their locations were visible by the twitching of the mud surface. “Are they going to die?” asked a nine year old. “Some will die, but perhaps a few will have their lungs working in time,” said the resident biologist. By 6 pm there was a thin crust on the mud, the twitching had stopped. With the water gone no kids came to watch, but there was much movement that evening – dozens of tiny toads hopping about, at least one in every square foot. This year the drying came on August 30, when the tadpoles were only two to three days old. Jeff dragged a kiddy wading pool down beside the drying pond and filled it with tap water, a few rocks, and some sediment. Then he and his daughter scooped those tadpoles remaining in the pond into the pool. There weren’t the thousands as in 2014, but several dozen survived the transfer. By September 11 (15 days into the cycle) all the visible movement in the pool water was from “toadlets,” perhaps a dozen with developed front and back legs. They would crawl onto the added rocks or the narrow rim of the pool to sun and rest. From the rim to the ground was more than a foot, so those that hopped off couldn’t return. The next day, September 12, 16 days after the first heavy rain, Jeff emptied the pool manually, and found only one toadlet which hadn’t left on its own. Left to the natural rainfall the 2015 season would have produced no new Spadefoots for the neighborhood, while Jeff’s Spadefoot nursery enabled a dozen or so to survive. But the real products of this nursery are in the thoughts of its visitors, how they envision answers to the question: “What happens when the water runs out?” The answers developed by Couch’s Spadefoots may not be appropriate for humans, but the extremity of their strategy makes clear how serious the question is.